Santa Maria is the first town you come across in the Los Santos region of Costa Rica. It is small, but the people are what bring this sleepy town to life. Whether you catch them at the popular karaoke night, shopping in the Mega Super, or just hanging out in the park, exploring the town and experiencing the people is part of the fun. However, getting settled into a new culture and becoming a new part of the community is challenging, so here are some of the main places, tastes and entertainment Santa Maria de Dota has to offer. Cafe Quetzal ( Los Santos Cafe): This cafe has many fancy espresso drinks, one which must be purchased in exchange for using the wireless internet connection. Lap tops only. Upstairs Internet: This Internet cafe is located above the Farmacia in the town's shopping plaza beside the police station. Internet is 500 colones per hour, and the cafe is closed for siesta between 12-1pm. Downstairs Internet: This internet cafe is behind the gas station and is also 500 colones per hour. It is not closed during siesta. This town has many sodas that serve mainly casados and fried chicken which are the cheapest option in town. Las Tejas pizzeria has the best pizza and pasta in town at reasonable prices (open weekends). La Taberna is the main pub in town that has the best burgers and greasy food to eat at good prices. It is located next to the Arbolito nightclub. There are about 3 or 4 bars in Santa Maria, but the only recommended one would be La Taberna that has Karaoke nights every Friday. 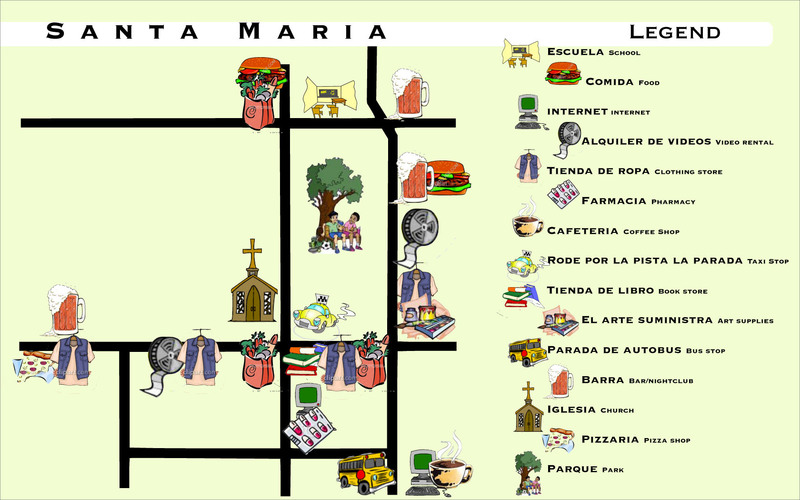 There are also Saturday night discos that are shared between the two towns of Santa Maria and San Marcos. Keep your eyes peeled for the signs or just ask a taxi driver for where the next dance is being held. Cabs stop running at around 10 pm, so make sure you have arranged a safe way home before going out. Santa Maria doesn't have the best of shopping. It is full of thrift and general stores. For the best shopping close by, catch a short bus trip to San Marcos (15 min) or Cartago (1 hr 40 min). There are 2 video stores in town incase you feel the need to catch a movie. Most of the films are bootlegged though for a word of warning. The nearest movies theatre is in Cartago. There is only one ATM in Santa Maria at the Banco National. Visa and Plus cards do not work here. The closest place to take money out is at the HSBC in San Marcos. Transaction fees vary depending on your banking institution but can be from $5.00 and up each time, so take out your money wisely. San Marcos de Tarrazu is the heart of the Los Santos region where everyone goes as a central meeting point. Full of young adults and agriculture, this coffee growing community always has something going on. Full of good restaurants, swimming pools and good shopping, this place will keep you searching for hours. Although this town has most of the nightlife, beware that cabs stop running early, so make sure you have a ride home, and NEVER walk alone at night. Los Santos Cafe / Cafe Quetzal: Wireless internet only with the purchase of one of their fine beverages. Cafe de Mi Terra: Has computers, wireless internet and fancy espresso drinks. You can make international calls here as well if you feel the need. Upstairs internet: Maybe faster than Cafe de Mi Terra. This internet cafe uses a prepaid card system (400 colones for 30 minutes or 800 colones for 1 hour). International phone cards can be purchased here as well. There are a lot of restaurants here, the ones listed are just the favorites. Let your taste buds guide you! Restaurant Talapia: Surrounded by fish ponds and covered by a thatched roof, this place has a little menu, good eats, and is pricier. Restaurant Tachos: Good Menu with great food and appetizers at reasonable prices. Restaurant el Banco: Good, quick, cheap food. Las Tejas Pizzaria: Good pizza and pasta at good prices. There are many clothing stores and goods for sale with a pretty good variety and prices. For the least expensive clothing, take a trip out of town to try Cartago or San Jose. The best bar in San Marcos is Los Olivos which is open every Thursday night for karaoke, and usually open Saturday nights for discos. 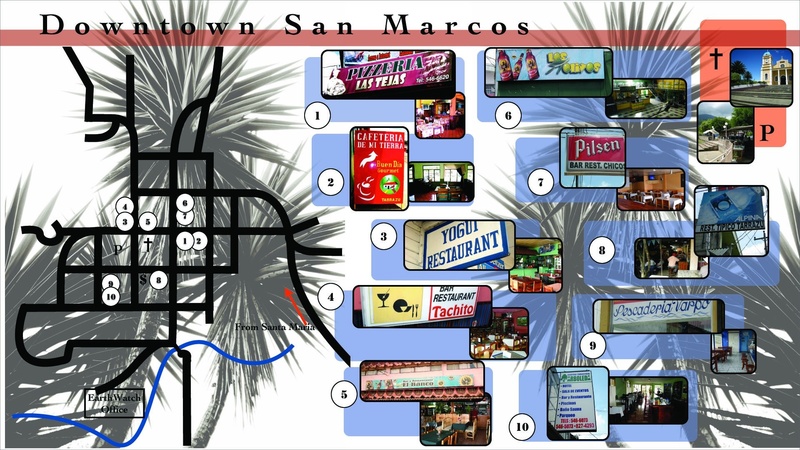 Remember that San Marcos and Santa Maria share weekend on where the discos will be, so keep your eyes peeled for signs. Other bars have karaoke nights on random days. Another location that also hosts some of the Saturday night discos is the Bullhorns Salon in La Sabana. To get money, head to the HSBC, Banco de Costa Rica (Banco National will not take visas or plus cards) or Scotia Bank in Cartago. There are daily buses that connect Santa Maria and San Marcos together. Many daily buses run to Cartago and San Jose also. Make sure to buy your bus tickets to San Jose in advance, they seem to sell out quickly. 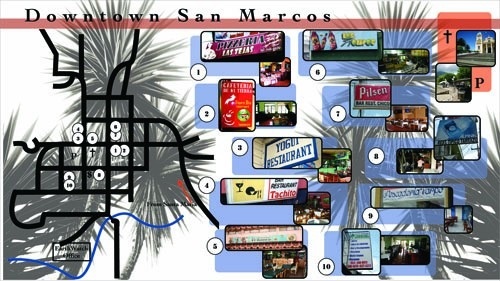 The tickets and bus schedules can be found at the two main bus stop locations in San Marcos and Santa Maria. There are two movie stores in San Marcos. There is also a gym and spin classes if you feel the need to sweat.